This is a card I made last weekend for a surprise 30th wedding anniversary we went to. The look on their faces was well worth it!!! And their family certainly deserves a lot of credit for all the organising and the secrets they went through to pull it off so well. Congrats to them all. 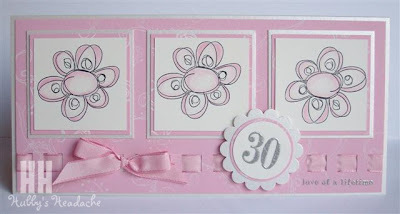 30 years traditionally is Pearl, so I started with an off-white pearlised card (which you can't see) - then I wanted to keep it pretty and soft (thinking creamy, pearlly). I have chosen Pretty in Pink and then stamped all over it with a "Scribble This" swirly stamp and Whisper White Classic ink. Using the Double Rectangle punch, I have gone along the bottom edge and threaded "Prety in Pink" taffeta ribbon through it. My flowers (also from "Scribble This") have been stamped using Stazon ink and then watercoloured using ink and a blender pen. They have been double mounted using some pearlised card and some pink card (stamped also). My "30" and "Love of a Lifetime" have been embossed with silver. Ps: Stay tuned - latest swaps should be arriving in the mail soon. Can't wait! This is gorgeous Deb. Love it. Beautiful Deb! Love the ribbon detail, just stunning!